Main sign located on Santa Monica Blvd. Today I decided I would journey to the Hollywood Forever Cemetery. I have always wanted to go there but never took the opportunity to do so until now. As it turned out, there is a program called Cinespia where they screen films in the cemetery. Tonight, Cinespia was screening the one and only horror film that actually terrifies me, The Exorcist. I was actually considering that this might be my chance to get past my Catholic fears of being possessed and attempt to watch a film that caused me to sleep on the floor in my parents’ bedroom for months when I was in the sixth grade. (I had a bed like Regan’s). I haven’t seen the movie since. Now that I am older and wiser, I could probably handle it. But alas, the showing was completely sold out so I had to settle for just roaming around the cemetery during the daylight hours. When I first got there, I really had no idea who was buried there or where to even start looking. So I just wandered around until I made my way to the Garden of Legends. Johnny Ramone, Hattie McDaniel, Jayne Mansfield and Cecille B DeMille can be found in this area (as well as many others that I am not as familiar with). But to the south of the Garden of Legends, you will find the stunning grave of Douglas Fairbanks. (You can also see a memorial to the Wizard of Oz’s Toto under a tree on the path to the east of the Fairbanks garden. After I left this area, I wandered around, enjoying the peaceful, serene setting and hoping I would find other names I would recognize but I was unsuccessful. I started to think that there were more Armenians buried here than celebrities (cemetery is located to the west of Little Armenia). Actually, I couldn’t get over some of the elaborate Armenian grave sites. Some of them were truly stunning. But in the 90 degree heat, I was tired of wandering around and not finding any other celebrity resting places (though I did find a beautiful Buddhist area). I noticed that on the west side of the entrance, there was a flowers and gift shop, and vending machine to purchase water. I made my way over there and I went into the gift shop. They had a few t-shirts, a map of the celebrity graves for $5, a commemorative Hollywood Forever Cemetery book for $20, and numerous books on tourist sites in Hollywood. 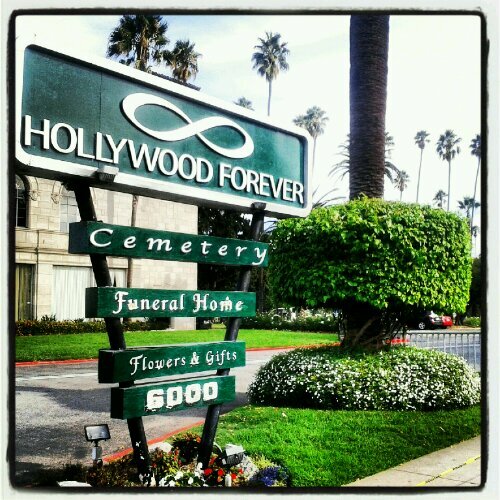 I should have stopped here first–and I recommend that anyone else planning on visiting Hollywood Forever, the map is a must!!! So now I was able to go back to the different areas to find the graves I missed, like that of Vampira, Griffith J. Griffith, Carl “Alfalfa” Switzer, and countless others. Unfortunately, I had purchased my map too late in the day. The grave sites that I really wanted to see were located in the mausoleums that were locked up at 2pm. So I wasn’t able to see Rudolph Valentino, Bugsy Siegel or Estelle Getty. But now that I own a map, I am definitely returning to the Hollywood Forever Cemetery at a later date.